Visit Fort Wayne, along with the Fort Wayne Restaurant Community, will be hosting its seventh annual Savor Fort Wayne Restaurant Week; January 8-19, 2020. Participating restaurants will be offering three-course, value-priced menus for diners to enjoy. What is Savor Fort Wayne? Savor Fort Wayne allows diners to take advantage of three-course, value-priced menus at some of Fort Wayne’s best restaurants each year in January for 12 days. When will Savor Fort Wayne take place? Each year in January- the next one will be January 8-19, 2020. This restaurant week will take place for 12 days. How do I participate in Savor Fort Wayne? Simply review the list of participating restaurants and menus, determine where you want to dine, make reservations if necessary and enjoy a three-course, value-priced meal. No coupons or passes are needed to participate. Are the Savor Fort Wayne menus available at lunch and dinner at each restaurant? Each restaurant decides if they will offer their Savor Fort Wayne menu for lunch, dinner, or both. Please check each restaurant menu page to know when their menu is being offered. When are menus added to SavorFortWayne.com? All the time—please be sure and check our site frequently as sometimes menus change or new ones are being added! How can I stay up to date with contests and news about Savor Fort Wayne? Follow Savor Fort Wayne on Facebook, Instagram and Twitter @SavorFortWayne to always be in the know! We are always posting- not just during the actual event. Reservations are not required but are highly recommended. On each restaurant&apos;s menu, you will be able to see if the eatery accepts reservations or not. How many restaurants/locations are signed up for this year? We were thrilled to have 56 participating locations for 2019, the highest number yet! Restauarants for 2020 will be announced late 2019. What is the Parkview Lighter Choice option on the Savor Fort Wayne menus? Are there other great events happening during Savor Fort Wayne? Yes! Lots! We even created a special section called “Make A Night Of It” on SavorFortWayne.com highlighting other fun events going on. What makes it even better- those listed are offering discounted tickets and admissions! And don&apos;t forget to check out Current Fort Wayne for a full calendar of events! How does my restaurant participate in Savor Fort Wayne? Savor Fort Wayne is organized by Visit Fort Wayne. Please send an email to emily@visitfortwayne.com or call 260-424-3700. How can my company become a sponsor of Savor Fort Wayne? Please send an email to emily@visitfortwayne.com or call 260-424-3700. Please send an email to emily@visitfortwayne.com or kristen@visitfortwayne.com or call 260-424-3700. 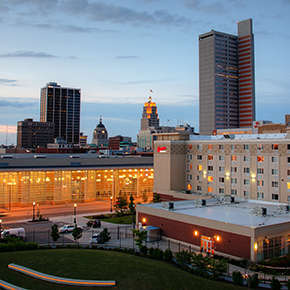 If you would like additional information about Savor Fort Wayne, please contact us. Savor Fort Wayne is brought to you by Visit Fort Wayne.